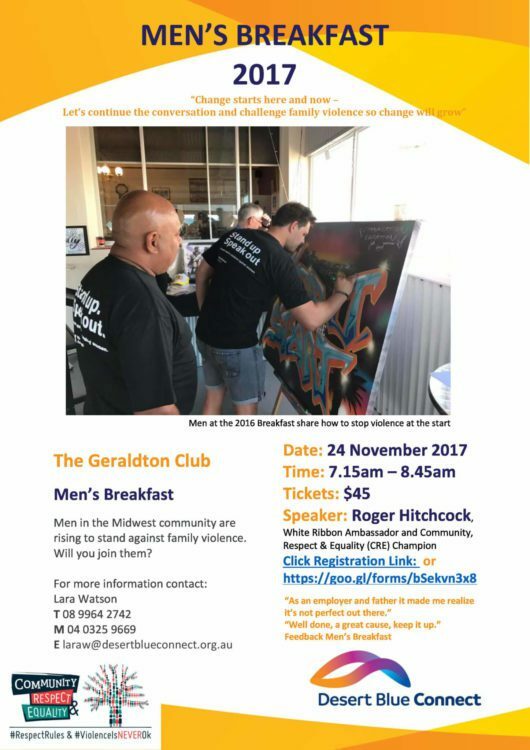 Local men in our community have organised a Men’s Breakfast which aims to gather men together to make a stand against family violence in our community. The breakfast will be held on Friday 24th November from 7.15am to 8.45am at The Geraldton Club. The speaker this year is Roger Hitchcock, White Ribbon Ambassador and Community, Respect & Equality (CRE) Champion. The 2017 Theme is : “Change starts here and now – let’s continue the conversation and challenge family violence so change will grow”.